Best 3…Things about the Summer! Well, it has been a long time since I’ve posted anything. In large part that had to due with it being summer. I have to say it was hard for me to actually sit in front of a computer and write when the sun was shining and the warm weather was calling my name. That is why I wanted to devote this post to the Best 3…Things about Summer! No matter where you are in the world, the fact that summer has a power over people. A way to make us feel better. I don’t know whether it is the weather (and all the warm days and nights), the longer days (that is always a bonus) or could it be the fact that we are able to get away from our day to day lives and take vacations or just extra long weekends. So, here are the Best 3…Things about Summer! Yes, BBQ is my number one choice as the best thing of summer. For me, I don’t think I turned on my oven all summer. All that meal planning that needs to take place during the year – out the door when summetime arrives. I always know what I’m having for dinner – BBQ! It’s great, easy and tastes so amazing. Aaaahhhh my mouth is watering as I write this. My second choice is the ability to just be outdoors. The warm weather allows you to do so much things outside and that is what summer is meant for. Road trips, camping, lounging on the beach, going for a swim and whatever else you like to do. That is why it is my number two choice. This is a post that I have been wanting to do for some time. I waited this long because I really wanted to get a sense of what was out there. I should say that every blog that I have looked at and been following are great. So much diverse ideas, lives and general interest out there. If there are people who are not out there blogging…they should be. I also find it an awesome form of therapy – just getting my ideas down, writing about the things that I like best…it liberating and I’m glad that I started (because now I know I will not stop). Also blogging literally get me away from the TV and all the bad habits that I want to get rid of in my life. As I write this post, I know that the three WordPress blogs that I put down today will always be a best but I know that as I continue my journey in blogging and as I read more and more blogs, this best 3 might change from week to week, month to month, year to year. So for this particular post, on today’s date, the blogs that I believe are the best have been included (there are so many honorable mentions that I just couldn’t list them all but I definitely following them). To me these blogs represent a good cross-section of life and so much more. The second blog is one that I really like…especially the title. Just read it and I guarantee you will smile at the quotes and sayings – especially the post about “What Fo You Do”. It is just a great idea. My last choice is Make Something Mondays! This blog is full of great and awesome do-it-yourself projects (and a few other topics). It is a fun blog and just a nice break to read these (and realize you might be crafty after all and that it really isn’t that hard). What blogs do you think should be included? Leave a comment and let me know! There is a time in all our lives when we look at what are job is and wish we were doing something else. At least that is how I have been feeling lately. When I was young I always wanted to be a marine biologist. It sounded so cool. Until I got older and realized you needed maths and sciences. I am not a math and sciences girl. So that meant, time for a change. Next I thought I would go into journalism. Travel the world, report on all the news worthy items and make a name for myself as a great journalist. Then I realized that type of career takes a long time (and to be honest, I think my parents were worried cause how would I ever be able to pay off my student loans). So, I chose to study something I enjoyed…history. However, unless you are going to get your doctorate, there really is no future in history. At this time, I just took a job because frankly bills needed to be paid. I started in administration but quickly realized that I needed to get out. Eventually I found myself as a financial coordinator managing budgets in the millions. From History to Finance…life is crazy sometimes.Yet the other day, I was having one of my ‘thinking’ moments and I thought about all the jobs that I wished I had. I know it seems funny to have doctor there but for me this was never a possibility – science and math. Plus I have developed a huge respect for doctors who don’t just become doctors for the money but who are actually provided a service to people and countries that don’t have the type of health care systems/care that we have in the Western world. Organizations like Doctors Without Borders are good examples of doctors using their skills to help those that are really in need. If I was a doctor, I would be the type who would travel around to countries and offer whatever help I could. I could really be doing good in the world. That is the main reason why I have made it my first pick. Since I like history, being an archaeologist is just a given. Plus Indiana Jones made it look so fun. I know in reality it isn’t quite the same as in the movies but it would be great to spend your life devoted to finding things from the past. To uncover items or people who give you an insight into how life worked. 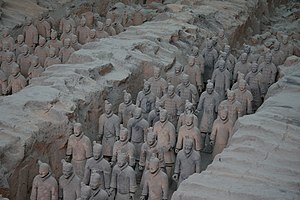 Imagine unearthing the Terra Cotta Warriors or discovering another egyptian tomb. Those are amazing discoveries but so are the small discoveries like pottery or utensils. They all tell a story. Such a great job! As for my final pick, a would want to be a sports agent. It just sounds exciting to negotiate and sign sports superstars – plus I hear the money is not bad at all! Plus I would love to get to all the games to support your player…that would be awesome. Since I am one those people that have unfortunately spent a great deal of her life in front of a tv…commercials have become something that I have come to enjoy and hate at the same time. There are certain commercials that stay in my mind and that is usually because they are funny and there are those that are just annoying and are played way too much (those are usually the companies that have a great deal of money that they can throw on advertising time). Commercials have become so integrated into tv (and now movie – which I was surprised when commercials started playing there) that we have companies willing to spend millions on only 30 seconds of air time during the Super Bowl. Yes, I understand they can reach more people but even after I see the ad, it doesn’t make me want to go out and buy a car…so I don’t understand their methodology but hey I am not the one being paid the ‘big bucks’ to create and focus group these ads to everyday, average folks. Getting ready to write this post, I thought back through the years on all the commercials that I have seen and liked and wanted to share them with all of you. I hope you enjoy. I have to say The Force – Volkswagen commercial is one of those commercials that just makes me laugh everytime I see it. It is so cute and so funny. The Old Spice ad was just clever and I did appreciate that (finally) a good looking man with hardly any clothing on was featured in an ad (all those beer commercials are just annoying). For this post, I wanted to focus on the ways to brighten someone’s day. We are all leading hectic and crazy lives and the way in which we interact with our fellow human beings has started to suffer. People barely say thank you anymore, others won’t even give up their seat to someone who needs it more. These new behaviors are shocking and frightening. That is why I wanted to share some of the ways that anyone can help brighten someone’s day. The other day, I was standing in line for a coffee, checking my email and not really paying attention to what was going on around me. When it was my turn at the counter, I asked for a Tall Pike Place (I was at Starbucks). I started to pay but the server told me it wasn’t necessary because the person in line in front of me had purchased my drink for me. I quickly looked around to see who might have been in front of me but I couldn’t tell. When I looked back at the server she just smiled and said “He said he was doing it to brighten someone’s day.” Well, thanks to that amazing man – he did brighten my day and I smiled all the way to work. The very next day, I did the same thing for someone else. I hope I was able to brighten their day…even for just a few minutes. For my next pick, this was something I use quite often. I have a great friend who is also a co-worker. He was having a bad day so I decided to send him a funny (free) e-card that had dogs doing the cha-cha. The message to him was simple – thanks for being you and enjoy the dancing dogs. Well, after he received the card, he called to say thanks and how that crazy card would get him through the day. Small things…sometimes have the greatest effect. For my last Best 3 pick…it is a tried and true method and supposedly the best medicine. Make someone laugh. I know this helps brighten my day and it should help brighten someone elses. Let’s face it, we’ve all experienced times when we had to turn to food to help comfort us through a difficult time in our life. Whether it was a break-up, losing your job, financial stress, death…food has the ability to help us get through it. Why? I really don’t know. Maybe its the fact that a lot of our lives revolve around food. Comfort food: food prepared in a traditional style having a usually nostalgic or sentimental appeal (definition provided by http://www.merriam-webster.com/). Every celebration I know, no matter what culture, religion, food has a major role. That could be the reason that we find comfort in food when our lives are out of control, we turn to foods that remind us of something special and good. There are cookbooks even that are devoted to comfort food – Whatever the reason might be, I wanted to devote a post to these comfort foods – because like many of you, these 3 best foods have gotten me through some tough times and have helped to provide me the comfort I needed. The first pick shouldn’t surprise to anyone. Ice cream is a standard comfort food and probably has contributed to the fortunes of all the ice cream companies in the world. They must make a mint on people like me or any others who have made ice cream a comfort food. I know personally when I need it, I turn to my favorite – Ben and Jerry’s Cookie Dough. This has been a flavor that has been eaten up when I’ve been involved in break-ups, a stressful day, or just worried about the outcome of a certain action. It has been a constant food in my freezer and has never let me down. Thank you Ben and Jerry’s! Yes, I will admit it, I could finish the whole carton myself (I will not be ashamed of that!). Popcorn is another personal comfort food that has been there to get me through some tough times. Why popcorn? I don’t know, I just know that it helps and that is all there is too it! For my third Best 3 pick, Kraft Dinner was the obvious choice. It’s food that I know I shouldn’t eat because I know it’s not good for me but KD has a way of reminding me of my childhood. It was always a snack in our house – not something that we had a lot…and it’s a food I remember and can associate with good times. At this moment, I happen to be an unlucky person in a mall. It is crazy and just plain horrible. We have guests and they wanted to shop, so I find myself in a packed mall. You would not know that the economy is bad here…and there are so many teenagers. Where are they getting their money…are they all drug dealers? because that is a profession that I am sure is doing well. How anyone can want to be here is above me. My number 3 best pick is a night club. When I was younger this was a great place but as I get older, this is a place a want to avoid. Don’t get me wrong, I love to go out and dance but not with the young crowd – they scare me.